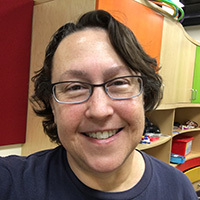 Tracy Fullerton is an experimental game designer, professor and director of the USC Games program. Her research center, the Game Innovation Lab, has produced several influential independent games, including Cloud, flOw, Darfur is Dying, The Night Journey, with artist Bill Viola and the recently released Walden, a game, a simulation of Henry David Thoreau's experiment at Walden Pond which was named "Game of the Year" at Games for Change 2017 and "Developer Choice" at IndieCade 2017. Tracy is the author of "Game Design Workshop: A Playcentric Approach to Creating Innovative Games," a design textbook used at game programs worldwide, and holder of the Electronic Arts Endowed Chair in Interactive Entertainment. Prior to USC, she designed games for companies including Microsoft, Sony, MTV, among many others. Tracy's work has received numerous honors including an Emmy nomination for interactive television, Indiecade's "Sublime Experience," "Impact," and "Trailblazer" awards, Games for Change "Game Changer" award, the Game Developers Choice "Ambassador" Award, and Time Magazine's Best of the Web.